Rolfing by Formula (10 Session Series) The 10-session Rolfing series is the traditional format used by Rolfers to balance the body and improve posture. 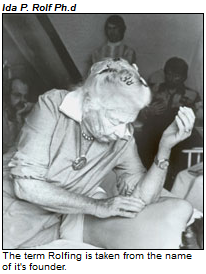 This Rolfing series is the best approach for most people who have not been Rolfed previously. Rolfing by Principles (Advanced Work) is performed by Certified Advanced Rolfers to effect specific structural changes to enhance function, movement and performance. Advanced Rolfing is a preferred strategy for rehabilitation from injury and to improve physical performance. is used to fix muscular and skeletal problems through specific soft-tissue manipulation and by improving joint mobility. Movement Analysis and Postural Analysis are an important part of a Rolfing session and provides the client and Rolfer important information in the design of Rolfing interventions and treatment. Cranial and Visceral Manipulation is a gentle form of skeletal and fascial movement with a basis in osteopathic principles and may be incorporated into a Rolfing session or can stand alone as treatment. Dermo Neuro Modulation (DNM) is a gentle system of manipulation of nerve tissue which releases soft tissue entrapment of nerve tissue and pathways. Fascial Fitness is a specific exercise approach designed to strengthen connective tissue (fascia or the fascial net) which may be damaged or weakened due to injury or repetitive use and negative pattern formations. Guidance in Core Strengthening and Stabilization ensures structural stability by strengthening key muscle groups and providing stability to joints and the skeletal system. Somatic Experiencing (developed by Peter Levine,Ph.d) is a system for resolving symptoms left behind from a traumatic accident or event. The SE approach is an exploration of sensation and feeling and aids the client in developing language for one's own body and insight into past events. SE is not psychotherapy but is a heightening of awareness of sensation.